Sears and Dollar Tree are the only shopping center businesses that remain operating as of 2015. A Big Boy restaurant and a Bank of America branch are located on out-parcels in front of the shopping center. In 1957 the Detroit suburb of Lincoln Park welcomed a brand new shopping center with 30 stores, 3,000 parking spots, and over 600,000 square feet of interior space with great fanfare. The shopping center was one of the largest, if not the largest shopping center in the Southern Detroit area, for over ten years until the mall building craze finally reached the southern part of Detroit around 1970. A majority of the shopping center was located in Lincoln Park, while Albert's Market and Detroit Typewriter Mart were located behind Sears and within the limits of neighboring Allen Park. There is a list on another site of the 30 original tenants of the Lincoln Park Shopping Center. Sears opened a year before the rest of the shopping center (1956). Throughout the 1960s, the Sears store was one of the top grossing stores in the chain; in fact it was number one for some time. Due to the massive amount of business, Sears added onto its auto center during the 1960s. That expansion brought the store to its current size of 277,218 square feet; which made it one of the largest Sears stores at the time. The Sears store is still one of the largest in the chain nearly 60 years later. By the mid 1980s it was clear the Lincoln Park Shopping Center would need to update itself in order to keep thriving. A number of malls were built in the Detroit area and took some business away from the shopping center. Kroger had also left the shopping center for a "greenhouse style" store a mile south on Dix Highway. That Kroger later moved across the road from the Lincoln Park Shopping Center in the 1990s where it remains today. There were also other sizable vacancies in the shopping center. One thing was clear; the shopping center needed to bring in more anchor stores if it was ever going to be a powerhouse again. So in the 1980s the shopping center did just that. The shopping center was renovated, the movie theater was expanded to eight screens, and a number of new stores moved in. Some of those new stores were Dunham's Sporting Goods (in the old Kroger space) and an F&M Super Drug store that was built from the ground-up near Dix Highway. Behind Sears the Albert's Market was razed and Farmer Jack took over part of the Detroit Typewriter / Giant office Equipment building; using the space where Albert's was as a parking lot. 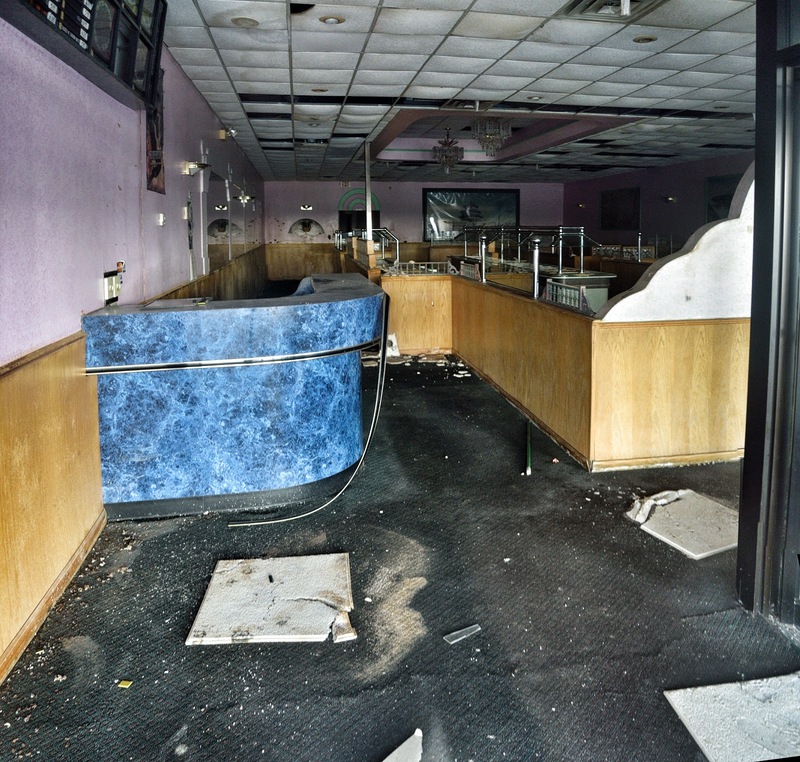 In 1995 the shopping center's last remodel happened. I believe both KB Toy Works and Old Navy opened around that time. The Lincoln Park Shopping Center broke into the 21st century with an occupancy rate around 100 percent. Rest of the strip mall not pictured in first shot. Throughout the 2000s and into the 2010s, stores left the shopping center one by one until only Sears and Dollar Tree were left. Some closures were due to company bankruptcies; this was the case with Harmony House (2002) and KB Toy Works (closed in a wave of closings in 2007 / 2008 when the company was emerging from bankruptcy). Other retail stores such as RadioShack, Dunham's, Old Navy, and GameStop moved to other nearby shopping centers. Stores such as Famous Footwear and GNC closed without relocating because other stores were fairly close by. Independent businesses either closed or moved elsewhere. Walmart had wanted to build a store at the shopping center since around 2007. According to those plans the strip mall and the old Giant Office Equipment store would have been demolished and a supercenter would have been constructed on the property. Another retailer planned to open in the former Farmer Jack store. The Walmart plans all fell through do to a legal dispute between the shopping center and Sears over who owns the delivery easement behind the strip mall. It was found that Sears still owns that part of the land; which essentially gave Sears the power to block Walmart's plans. 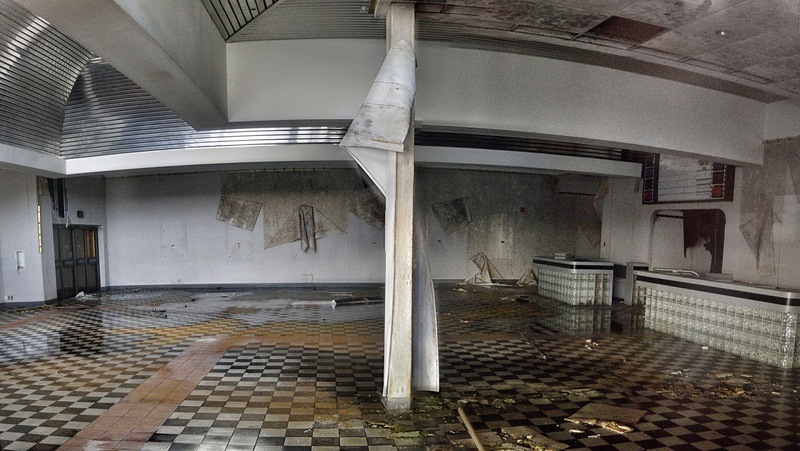 Today much of the shopping lies vacant and in disrepair. Relic from Elmars Restuarant; one of the original tenants from 1957! These pictures are arranged from the stores furthest right to Sears, then the stores behind Sears in Allen Park. Yes, a Sears Water Tower! Also, there is a Big Boy restaurant on an out-parcel in front of the shopping center. Detroit is one of the few areas that still has a fairly decent concentration of Big Boy restaurants still open. On other out-parcels there are a Bank of America branch and a Former Wendy's restaurant (relocated nearby), but I must have missed getting pictures of those places. Thanks for viewing! If you have anything you would like to add to the story about the Lincoln Park Shopping Center please feel free to comment below; anonymous comments are welcome! 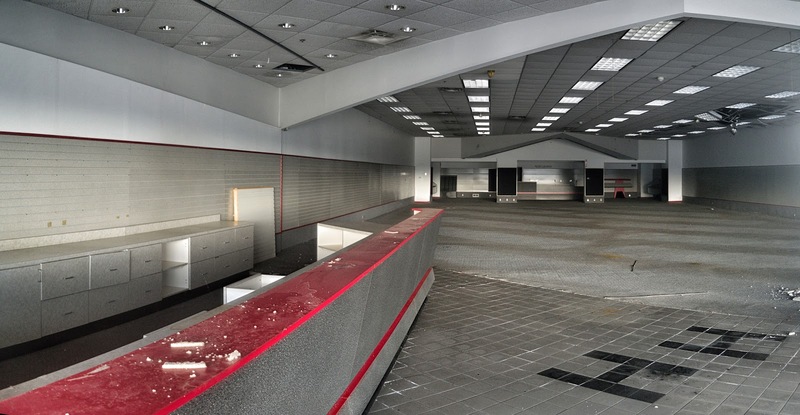 All photos Copyright 2015 Dead and Dying Retail.